There’s a hidden cost to your burger. The humble burger. For many of us, it’s one of life’s simple pleasures. Juicy and filling, with an almost never-ending choice of toppings, relishes and accompaniments, it’s no wonder the burger is one of the world’s favourite foods. There’s even an International Burger Day, every 28 May. 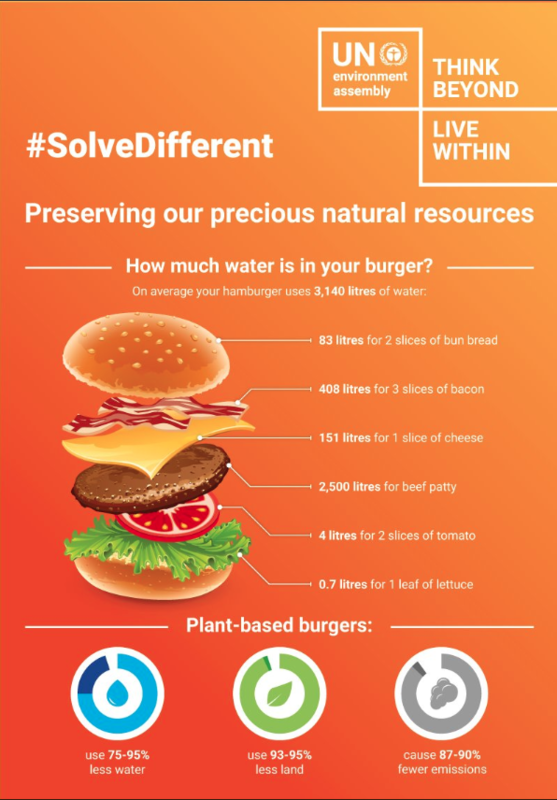 But there’s a hidden cost to your burger: its production is very resource-intensive. A surprising amount of water, in particular, is guzzled up as each one is made. So much so that at around 2,000 litres per burger, the contents of an Olympic-size swimming pool would only amount to 1,250 burgers. And if you’re fond of bacon and cheese toppings, the amount of water involved swells to as much as 3,000 litres. In many parts of the world, water security is becoming increasingly important. Not only does beef production call for large amounts of water, it requires stable, secure sources of it too. This is particularly pressing in drought-stricken parts of the developed world, such as Australia or South Africa. The Australian government has begun investing in schemes to deliver water for agriculture through a series of irrigation programmes. It is hoped this will reverse the trend of rivers being diverted to support farms, which has damaged some river ecosystems. Australia is the world’s second-largest beef exporter, with around 60% of the national herd destined for overseas consumption, at a value of $5 billion annually. The country has a total accessible water storage capacity of 81,000 gigalitres (a gigalitre is equivalent to one billion litres), but around a third of this capacity is dry. Alternative sources of protein offer more sustainable and environmentally friendly production processes. They will also make it possible to support a growing global population. The World Economic Forum’s white paper on Alternative Proteins lays out the case that current rates of meat consumption cannot scale to meet the needs of a projected 10 billion people by 2050. However, plant-based diets are already far more common in parts of Asia than in Europe or North America, for example. Growing interest in veganism, such as the Veganuary trend, is one recent example of how some developed economies are reducing their meat consumption. Sales of meat substitutes grew by 451% between February 2014 and February 2018, and by around 20% in the US over a similar period.